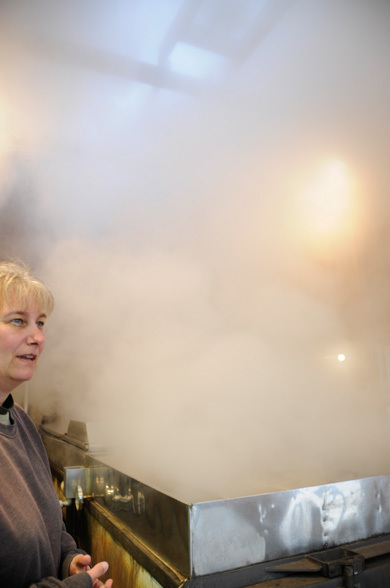 A sweet heavenly fog permeates the sugarhouse. Scent memories conjure up cotton candy and caramel apples – but I am smelling something more earthy, spicy, an aromatic sweetness that makes me hungry – not for pancakes (as it must for others) but for roasted pork tenderloin and winter squash and butter and drizzles of caramelized maple syrup. 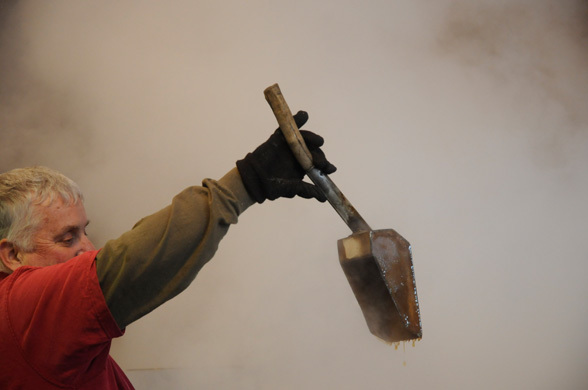 And toil doth the sugarmaker while the fire burns and the sap bubbles! 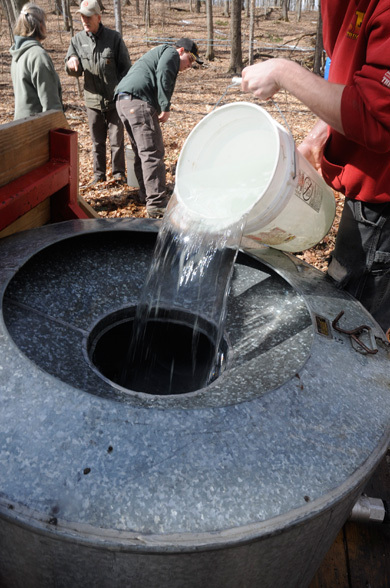 Maple sugaring season is short and harried. 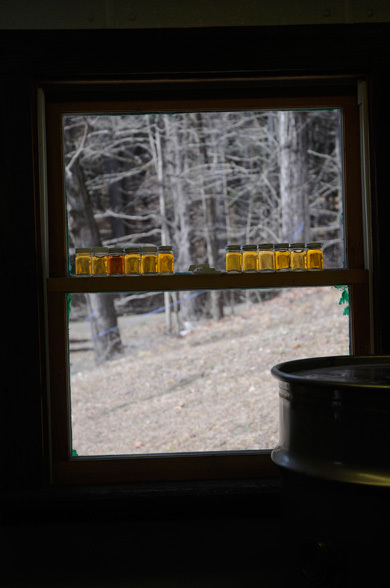 Sap begins an annual dance in maple sugar trees, Acer saccharum (think sucrose), in late winter when days begin to warm while nights still turn to freezing. 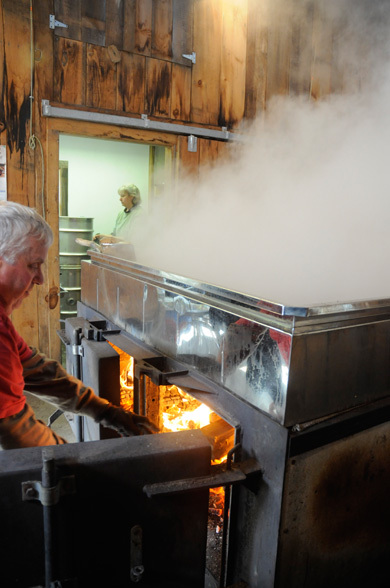 You can be assured that folks from hereabouts in northern New England will claim “it’s sugaring time! 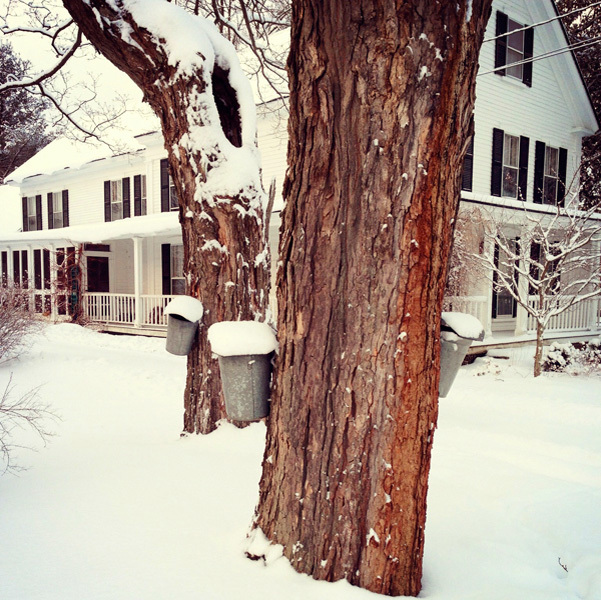 Stately maple trees lining back roads and town greens will suddenly sport buckets. 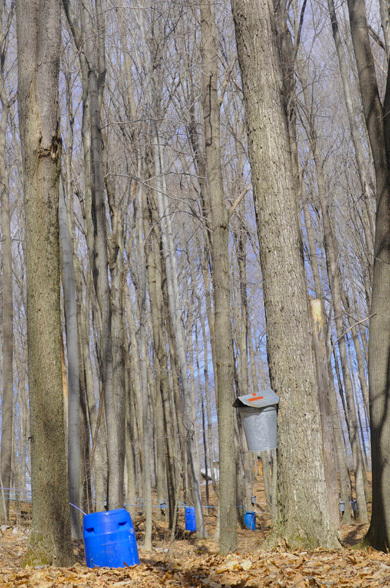 Groves of maple trees, called a sugarbush in maple sugaring terms, will be traditionally tapped with spiles (spouts) and buckets or with a modern system of tubing (pipeline) running from tree to tree and a vacuum pulling sap to a central collection point. 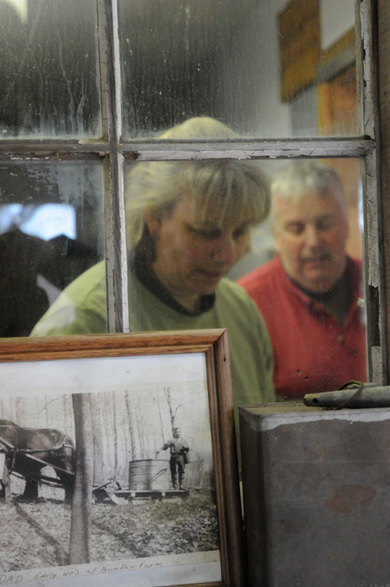 Steve Glabach and his wife, Maria, of Dummerston, Vermont use both systems and their children, Ted and Theresa, work alongside them during the short season as do other family members, friends, and volunteers. 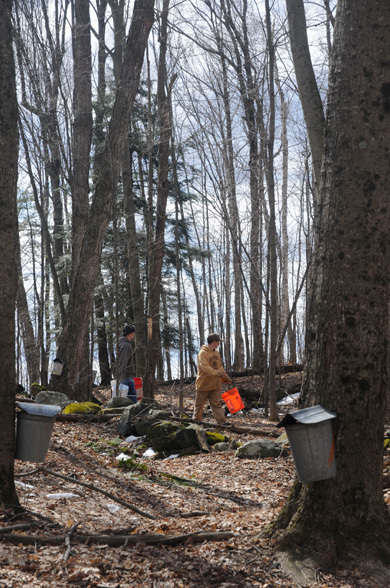 I spent part of a day following the frenzy and was exhausted watching a young volunteer crew rushing through the sugarbush gathering sap from buckets and sloshing off to fill a storage tank pulled by a tractor. The tractor took off down the road and pulled behind the sugarhouse where a gravity fed line brought in all the watery goodness. 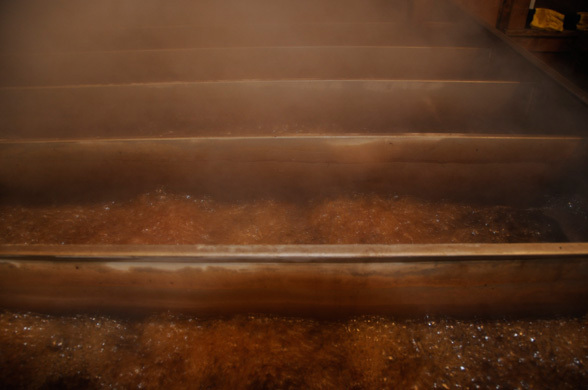 The Glabachs, like many other sugar makers, use a reverse osmosis machine to assist in making maple syrup – it concentrates the sap for processing in a evaporator set over a heat source – an arch, or combustion chamber. The Glabachs use wood to fire their arch and it is the combination of wood smoke and steam escaping from the sap that smells so delicious. Days are long and nights are longer during this short sweet season. 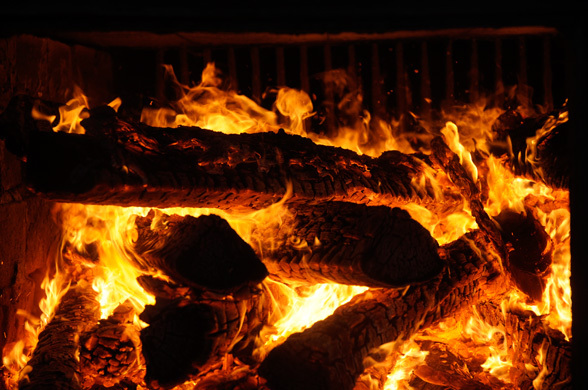 The fire must be stoked to continue the boil drawing water from the sap and as the sap turns to syrup a constant vigilance must be kept to keep the syrup from burning and to draw off the syrup as it finishes. 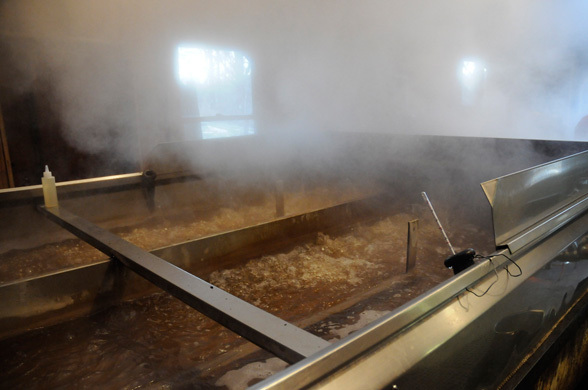 Ted Glabach pouring just drawn off syrup into one of many filtration systems used in the making of syrup – a compression system that will filter out the last large bits of minerals resulting in a sugar sand. 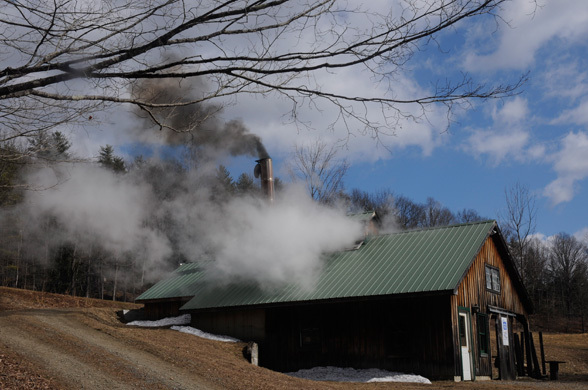 Vermont’s forests are filled with maple trees, approximately 1:4. 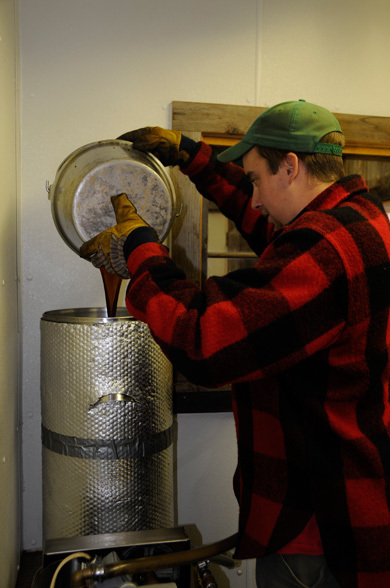 The higher sugar content in the sap, the less sap needed to make syrup – the rule of thumb is 40 gallons of sap to make one gallon of syrup. 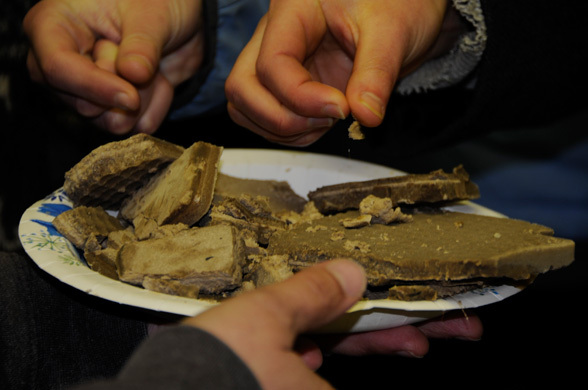 Maple syrup is good for you: calcium, manganese, potassium, and magnesium and full of antioxidants too! 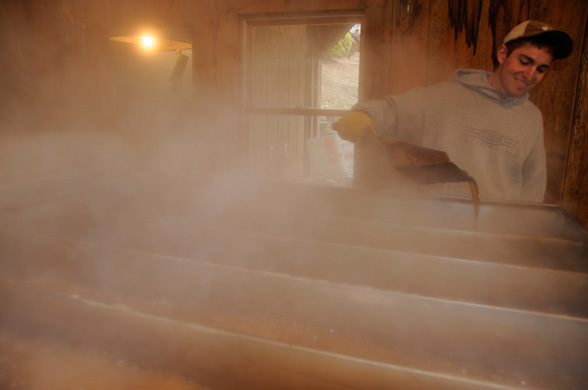 This entry was posted in Making Maple Syrup and tagged Acer saccharum, Jane Booth photographer, Jane Booth writer, Leader Evaporator, Lehman, maple trees, Proctor Maple Research Center, sugarhouse, sugarmaker, Vermont agriculture, Vermont Maple Sugar Makers Association, Vermont maple syrup on March 21, 2013 by Jane Booth. Heirloom apples and Vermont artisan cheese are a match made in heaven. 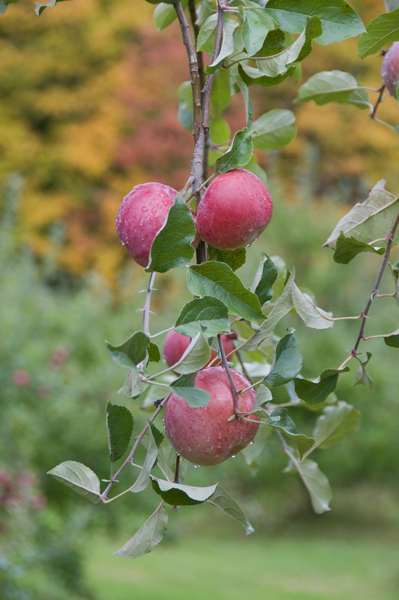 Poverty Lane Orchards and Alyson’s Orchard in New Hampshire and Champlain Orchards in Vermont offer a good selection of heirloom apples. Please ask Jane Booth for permission to reproduce her copyrighted photographs and/or writing. Email jane.booth.1@gmail.com or call (802) 866-3329. 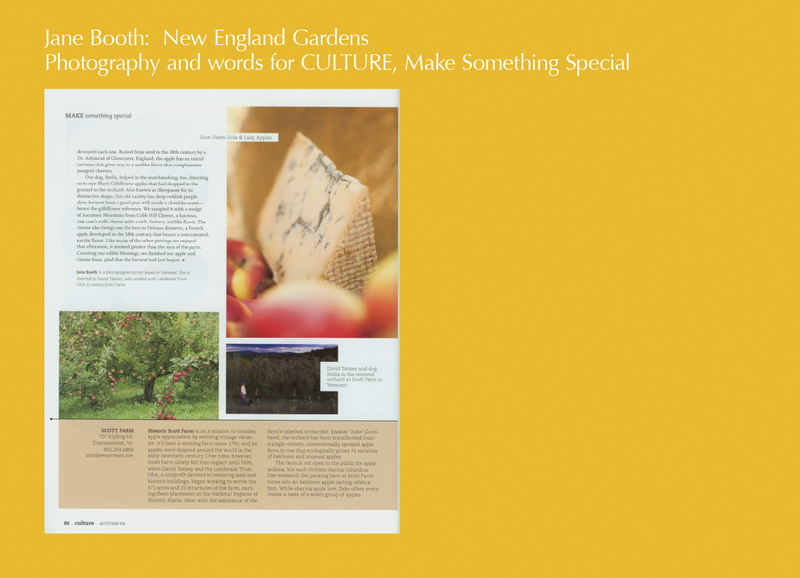 Jane has spent a good part of her career photographing and writing about gardens and small farms for Gardens Illustrated, Yankee Magazine, Country Living, Country Living Gardens, Better Homes & Gardens, Old House Journal’s New Old House, among others and Cape Cod Home where she produced an ongoing column and feature stories. David Tansey founded The Landmark Trust USA in 1991. He is the past president of The Landmark Trust USA and The Scott Farm and was involved in every step of revitalizing Landmark Trust USA and Scott Farm properties. This entry was posted in Antique Apples and Other Orchard Fruits, Heirloom Apple Varieties, Heirloom Apples and Cheese, Published Works and tagged American heirloom apples, antique apple orchard, antique apple photographs, antique apple pictures, antique apples, apple orchard, apple trees, apples, David Tansey, food, fruit, heirloom apple orchard, heirloom apple pictures, heirloom apple pie, heirloom apple trees, Heirloom apples, heirloom apples and cheese, heritage apple orchard, heritage apples, Jane Booth, Jane Booth garden photographer, Jane Booth garden writer/photographer, Jane Booth photographer, Jane Booth writer/photographer, southern Vermont apple orchard, southern Vermont heirloom apple orchard heirloom apple photographs, uncommon apples, unusual apples, Vermont food, Vermont heirloom apple orchard, Vermont heirloom apples on March 18, 2013 by Jane Booth. Heirloom apple pie and Vermont cheddar cheese, a perfect pairing. It’s lunch time and poor us, all we have to eat is a fresh-baked apple pie filled with the last of the apples gleaned in the fall — Bramley’s Seedling, England’s favorite baking apple originating in the early 1800s; Northern Spy a 1800s seedling from New York; and one of my favorite baking apples – Rhode Island Greening, a colonial apple from about 1650 discovered in Green’s End, Newport where a Mr. Green ran a tavern. The farm’s cooler has been turned off since December, yet these old timey apples are still firm and have held up wonderfully in long months of storage. My husband, David Tansey, loves making pie and because he is such a good pie crust maker I have stayed away from the task until now. I begged him for his recipe at breakfast and parcel it together but ask him to roll out the dough as it seems too wet (he knew it was just fine). 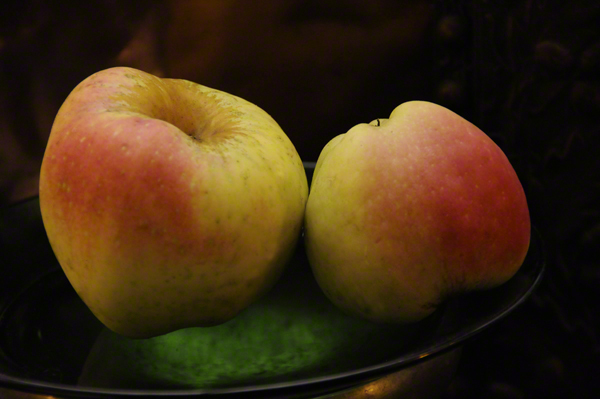 Northern Spy, a beautiful American heirloom apple perfect for a pie. When my mentor left for work, I forged ahead with the filling making things up as I went along. 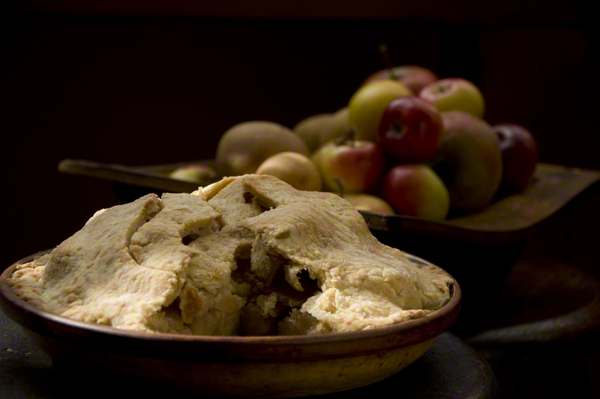 In the refrigerator I found the balance of a small bottle of iced cider from the Monteregie region of Quebec and used it to moisten peeled apple slices letting them mull around in the sweet scent of concentrated fermented cider while I fiddled with the dough. Just before topping the pie I realize I haven’t added any flour or sugar to the mix of apples and sprinkle a tablespoon of each over the mound of slices. Simple. Calville Blanc d’Hiver, the classic French baking apple has a crown shaped base. It is my absolute favorite when baking a tarte tatin. The pie, much to my delight, is a success. My husband admires the way it looks it from the time he arrives home for lunch. Admires it more when he tucks into a slice. And says all things yummy when I suggest he try a bite with a piece of Grafton’s clothbound cheddar attached to his forkful of apples and crust. We are both beaming. The cheese adds a sharp tangy crumbly bite cutting into the sweet sureness of apple, flavors melding into a taste sensation. We try the same effect again with a creamy cheddar from Shelburne Farms, not as sharp but just as nice with the pie. 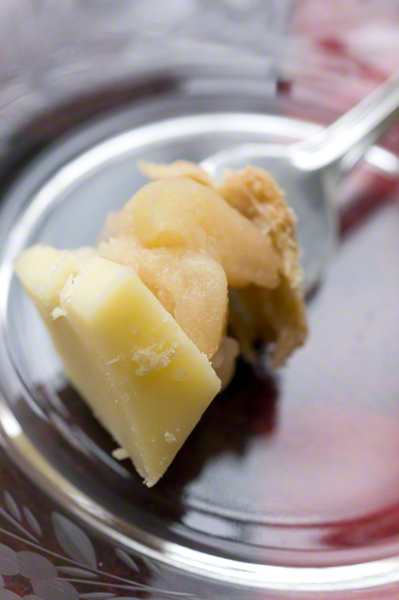 Tasting the clothbound cheddar again I tell David the cave-aged mushroom mustiness would be an excellent foil to the carmalized sweetness of a tarte tatin made with Calville Blanc d’Hiver, a fine French cooking apple dating to 1598. We vow to do just so when the new crop of apples are ready for harvest. 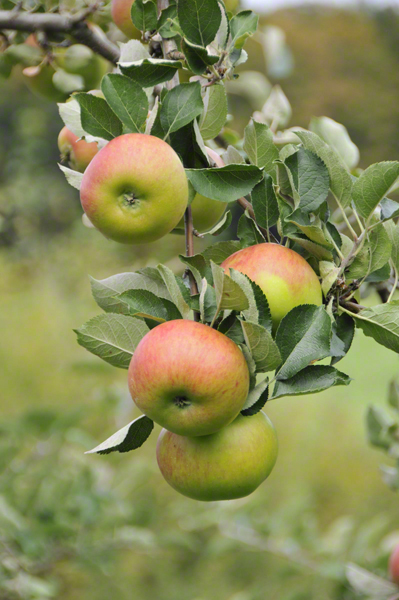 So many heirloom apples to pick from – indeed what variety to put in the pie. Please ask Jane Booth for permission to reproduce her copyrighted photographs and/or writing. Email jane.booth.1@gmail.com. 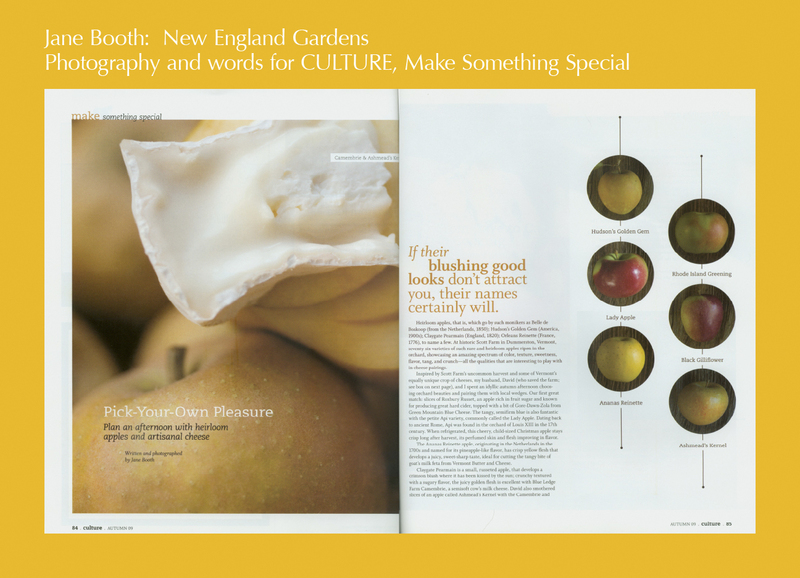 Jane has spent a good part of her career photographing and writing about gardens and small farms for Gardens Illustrated, Yankee Magazine, Country Living, Country Living Gardens, Better Homes & Gardens, New Old House Journal, and Cape Cod Home where she produced an ongoing column and feature stories. David Tansey is the founder of The Landmark Trust USA and past president of Landmark and The Scott Farm. 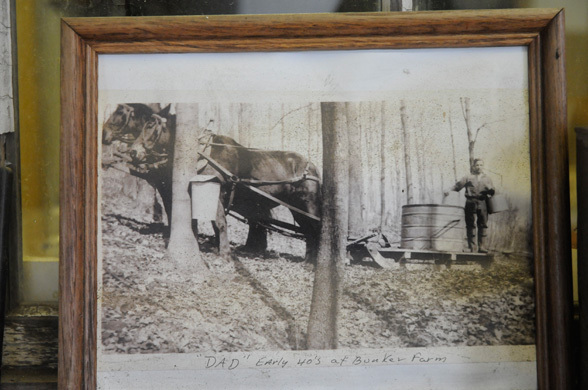 He was involved in every step of revitalizing Landmark Trust USA and Scott Farm properties and loves using heirloom apples when he bakes a pie. This entry was posted in Antique apples and other orchard fruit, Baking with Orchard Fruits, cooking with heirloom apples, Heirloom Apple Varieties, Heirloom Apples and Cheese and tagged American baking apple, American heirloom apples, antique apple orchard, antique apple photographs, antique apple pictures, antique apples, apple orchard, apple trees, apples, Bramley's Seedling, Calville Blanc d'Hiver, clothbound cheddar, David Tansey, English heirloom apples, food, French baking apple, fruit, hard cider iced, heirloom apple orchard, heirloom apple pictures, heirloom apple pie, heirloom apple trees, Heirloom apples, heirloom apples and cheese, heirloom apples baking, heirloom apples cooking, heritage apple orchard, heritage apples, iced cider, Jane Booth, Jane Booth garden photographer, Jane Booth garden writer/photographer, Jane Booth photographer, Jane Booth writer/photographer, Northern Spy, Rhode Island Greening, Shelburne Farms cheddar cheese, uncommon apples, unusual apples, Vermont food, Vermont heirloom apple orchard, Vermont heirloom apples on March 14, 2013 by Jane Booth. “Nobody is a better landscaper than nature,” states Raina Weber, dirt-streaked and beaming from her Housatonic, Massachusetts, native-plant nursery. 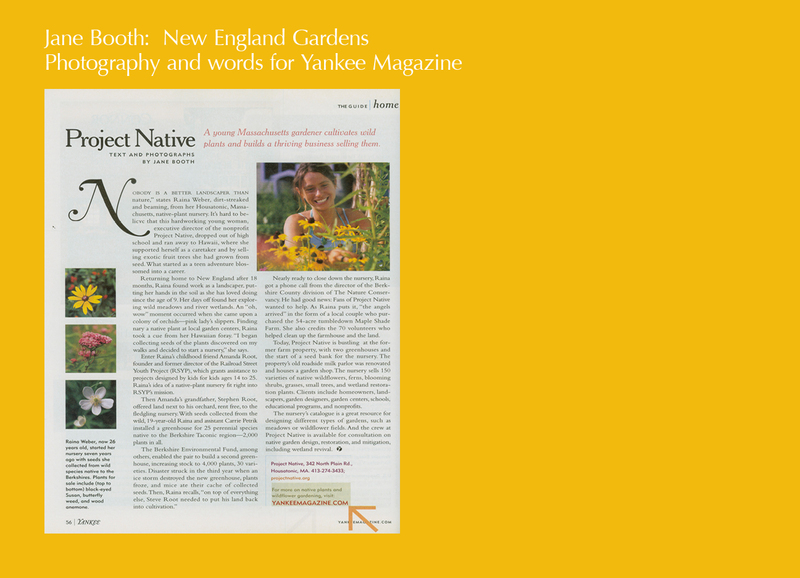 This entry was posted in Yankee Magazine and tagged Housatonic Massachusetts, Jane Booth, Jane Booth garden photographer, Jane Booth garden writer, Jane Booth photographer, Jane Booth writer, Massachusetts native plant nursery, native plants, New England gardens, Project Native, wild plants on March 1, 2013 by Jane Booth.